I'm not home alone very often. Luckily. I must confess, I'm pretty fearful when I have to stay alone overnight in our apartment. It might make a good thriller movie script If I told you what is usually going on in my head, when I'm home alone overnight. I can never watch scary movies because I would not be able to go to a bathroom after dark. I have a pretty good and colourful imagination if we speak about fear. I know all these thoughts are nonsense but I can't help it. A positive side of being home alone is the food I cook just for myself. What do you cook when home alone? I like such days. I usually make something I know P. would not like. Though he would obviously eat it, a phrases like "It was not bad, but you don't have to make it again" or "We have already had better food", would follow. I'm very lucky actually, because P. eats everything and almost never complains, and if he does, he is very diplomatic. This personal characteristic is more than convenient for my cooking experiments. I'm just a passionate amateur and still a beginner cook. So it comes as no surprise that some of my experiments are not really successful. However, that was not a case of this couscous salad. I'm not saying P. would love it. But that is the point. I was cooking only for myself. And I loved it! I had been having beetroot in the fridge for a week and I was looking for a good use of it. 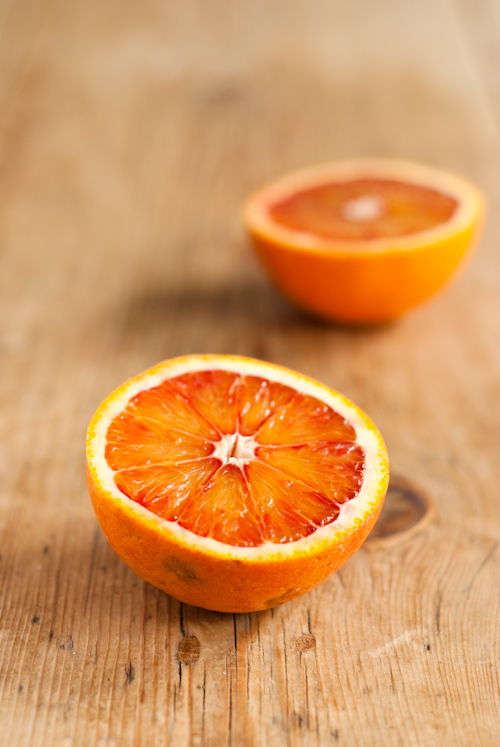 I also had many blood oranges from the market and leftover spinach from spinach and salmon pasta we had for dinner the day before. And I always have some nuts in my cupboard. Putting all these ingredients together made a wonderful salad for my lunch. 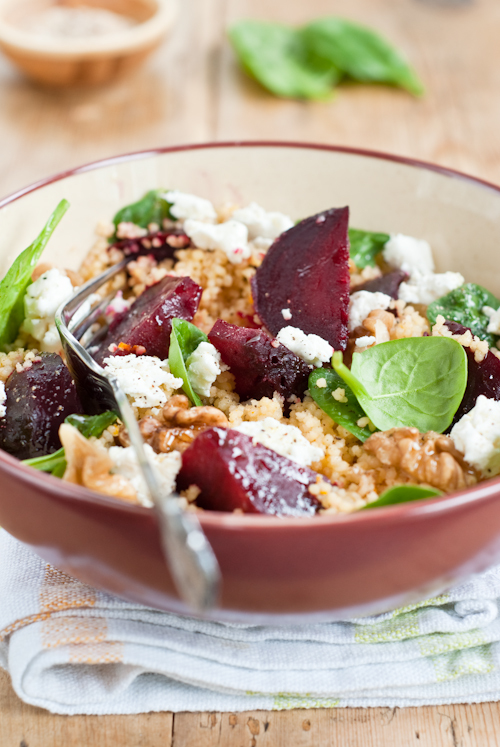 And goat cheese complements the sweet and fruity flavours in this salad. I think you won't be disappointed. The amount of ingredients in this recipe make salad for one person. You can easily double or triple the recipe, if you need. But I think I will make such recipes a regular part of the blog. I find it quite difficult to cook only for one person, and this time I made just enough without having any leftovers! 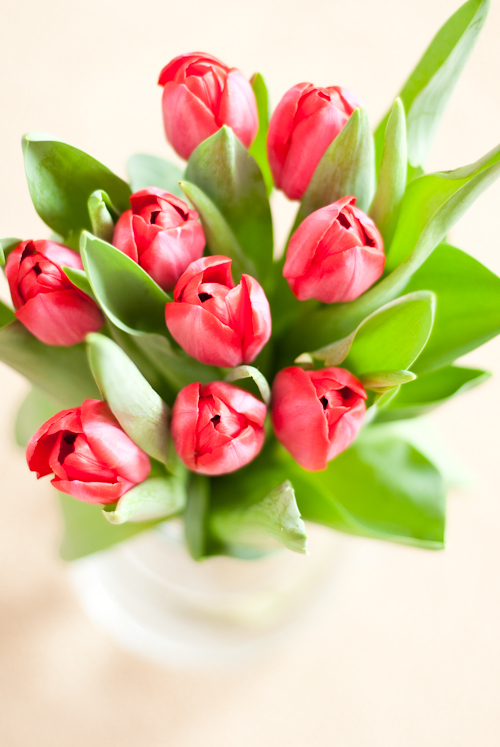 I leave you now with these beautiful tulips I got from P. last week. Bon appetit. 1. 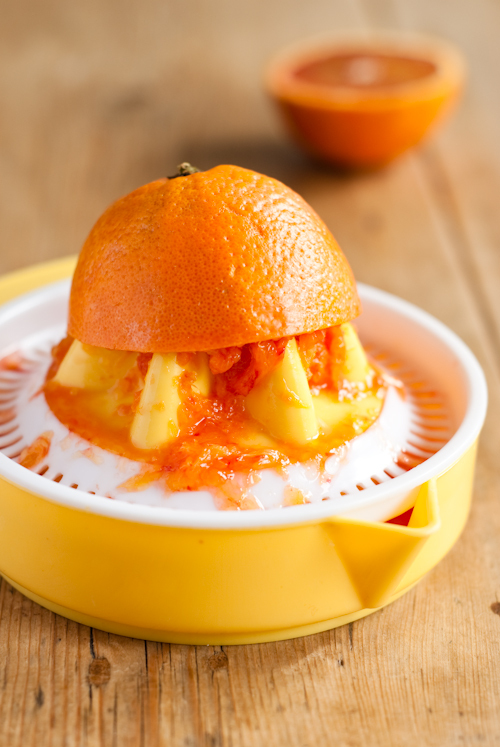 In a small saucepan, combine the orange zest, juice and 50ml cold water and bring to the boil. Pour the mixture over the couscous, stir well, cover and let stand for 5 minutes. 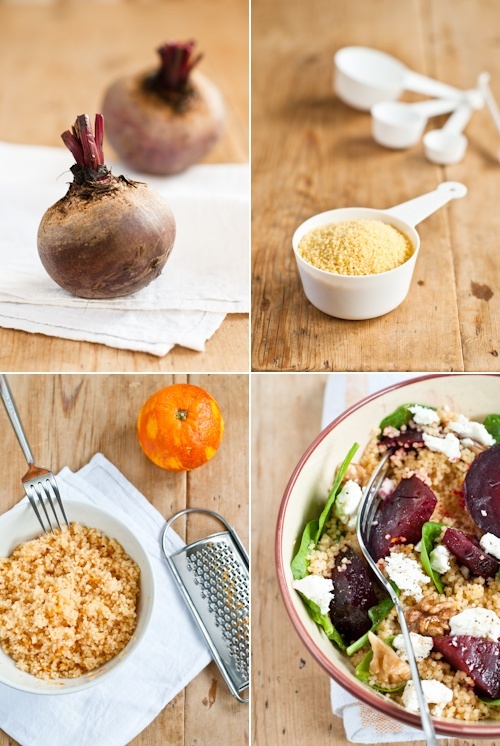 Fluff couscous with fork to separate grains. 2. 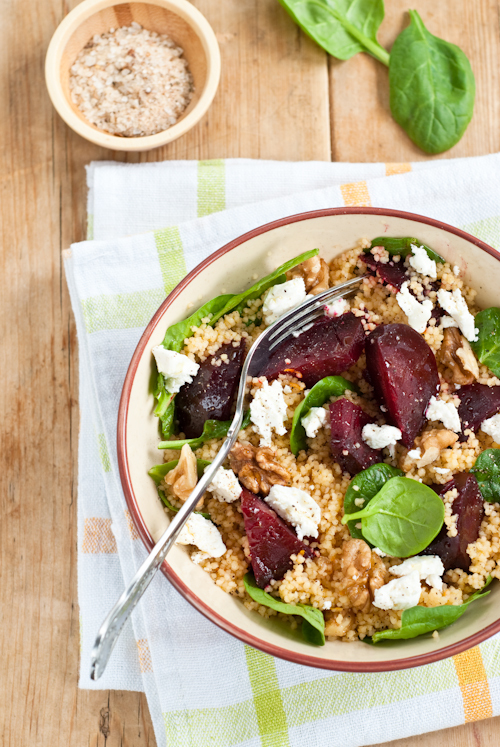 In a medium bowl, mix couscous, walnuts, beetroot and spinach leaves. For the dressing, whisk the olive oil, lemon juice, salt and pepper and pour over salad. Top with crumbled goat cheese.